Eddy Spaghetti is a new restaurant/bar located in the east side of Amsterdam. Studio Modijefsky along with Marlies van der Wel created a fictional character called Eddy, which became the starting point of the design of the interior. A collection of vintage black and white photographs, along with a number of colorful elements were used as inspiration to create Eddy and his personality. A series of graphics have been used throughout the space, which consist of Eddy’s personal items and his taste and desire. Eddy is a big fan of stripes, specifically spaghetti and pasta stripes; therefore line dominant graphics define the space. Items that belong to Eddy, such as his bike, have been used in the interior to create a personal atmosphere. Deep benches allow pasta lovers to truly enjoy their meal, as Eddy would while lounging on the bench against the window. 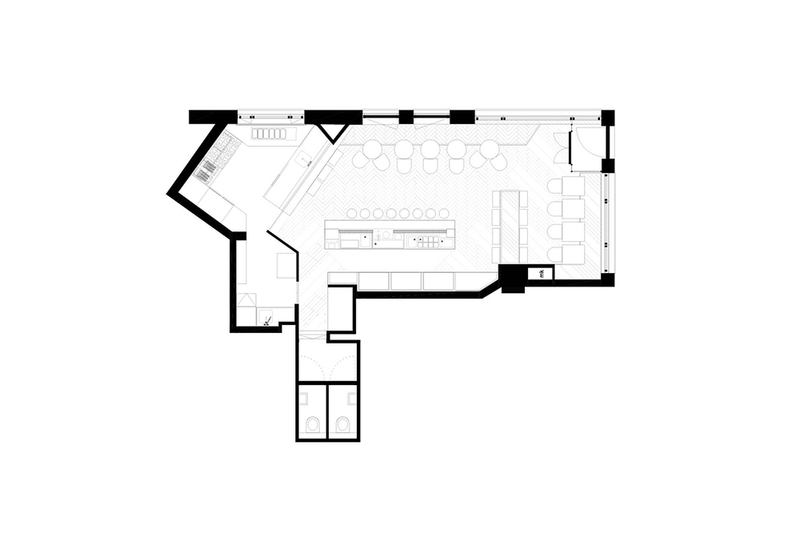 In order to make the most of what the space had to offer, the bar is designed between 2 structural columns. Bridging these thick columns wrapped in marble, the glass rack also displays a wide gin collection. The back bar is a one-piece fridge/shelf unit which displays a silhouette of Perroni beers in the fridges as well as providing storage space and extra wine display. A herringbone wood pattern floor, with a vintage touch of paint, gives the interior a cozy feel; combined with the pastel green of the walls Eddy’s spaghetti-lounge is a unique place to enjoy good food. A kitchen panel uses the pulley system to close off the kitchen in the evenings, creating a very flexible space; an open kitchen restaurant during the day and a bar in the late evenings. Studio Modijefsky has completed the interior design, identity, website and menu design for Eddy Spaghetti.